As physical as climbing is, it is even more mental. Ultimately, you climb with your mind—your hands and feet are merely extensions of your thoughts and will. Becoming a master climber, then, requires that you first become a master of your mind. 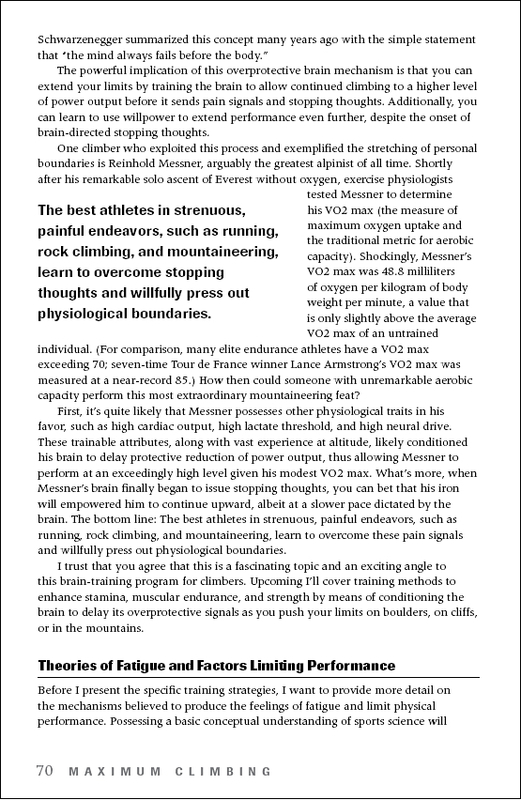 In Maximum Climbing, America’s best-selling author on climbing performance presents a climber’s guide to the software of the brain—one that will prove invaluable whether your preference is bouldering, sport climbing, traditional climbing, or mountaineering. Eric Hörst brings unprecedented clarity to the many cognitive and neurophysical aspects of climbing and dovetails this information into a complete program. He sets forth three stages of mental training that correspond to beginner, intermediate, and elite levels of experience and commitment—the ideal template to build upon to personalize your goals through years of climbing to come. There are volumes of books on how to train your body for climbing, but Maximum Climbing teaches you how to climb better by flexing the most critical muscle—the three-pound one between your ears. Using a highly detailed step-by-step process that is clearly presented for beginner to expert climbers, Eric Hörst instructs on mental training. His book runs that gamut from A to Z, but my favorites include how to manage fear, build confidence, and focus—three areas all of us need to work on but, until now, didn’t even know where to begin. Eric Hörst’s new book, Maximum Climbing, provides climbers with a clear path to athletic mastery. As a climber and performance coach, I’ve sought out every piece of information I could find on improving athletic performance. 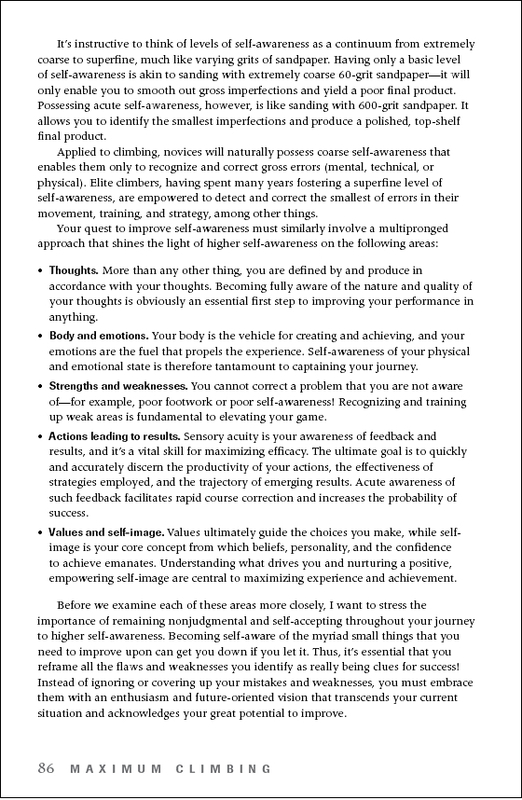 Use the methods put forth in this book, and you will improve; not just as a climber, but as a human being. As physical as climbing is, it is even more mental. Being technically sound and physically honed is not enough to navigate a high-ball boulder problem, personal-best lead, intimidating big wall, or treacherous mountain. Ultimately, we climb with our mind—our hands and feet are simply an extensions of our thoughts and will. Becoming a master climber, then, requires that we first become a master of our mind. 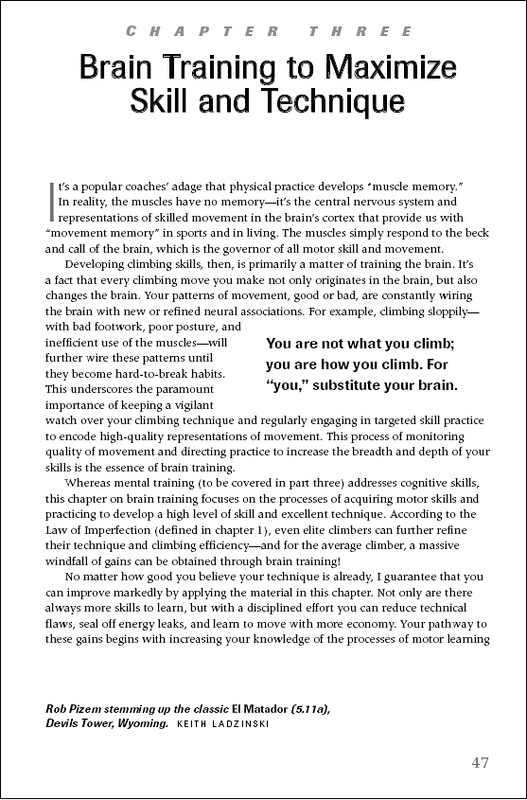 Actually, this book is about more than mental training—it’s about brain training. From the three pounds of brain matter between your ears emanate not only your thoughts, but also all motor skills, muscular recruitment, and the mystical forces of intuition and will power. 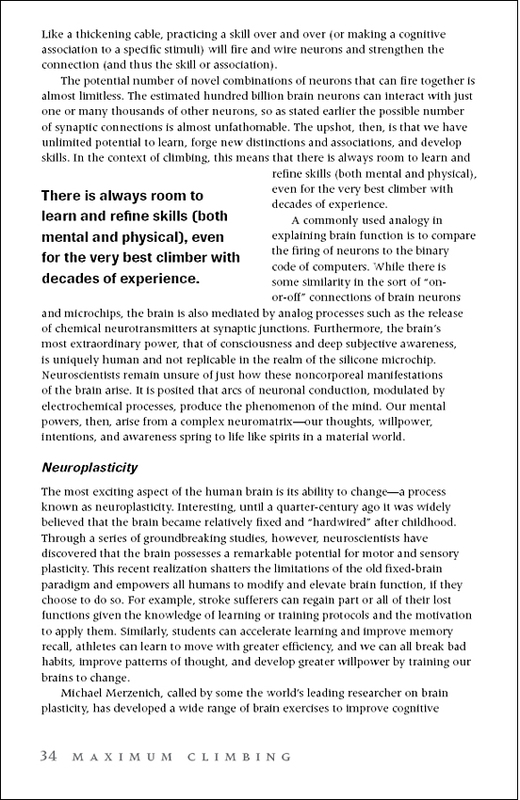 Given this broad purview it becomes clear that the brain is the epicenter of all aspects of climbing performance and that brain training is of paramount importance to participants in all climbing subdisciplines. No matter if your preference is bouldering, sport climbing, traditional, alpine, or mountaineering, the quality of your performance and experience arises from the hundreds of billions of neurons and synapses in your brain. Consequently, the brains of master climbers (of every kind) run a most complex “software” that facilitates execution of highly refined motor and mental skills, and gives rise to the intangible psychic forces of intuition and will power. You might consider Maximum Climbing, then, to be your user’s guide to the software of your brain. The prospect of brain training may initially trigger some thoughts of apprehension and perhaps even skepticism. After all, you’ve made it this far in climbing by way of your current program of climbing and training, so why venture into the unknown of Hörst’s brain-training program? The answer should be self-evident given a bit more thought. First, consider that breaking barriers and performing at a higher level demands that you not only train differently, but also learn to think and act more effectively. Furthermore, why do you choose to venture up an unknown climb? Because you wish to partake in a novel experience and in doing so explore your potential to achieve. These are the very reasons you must embark on a brain-training program—to discover a new level of life experience and to realize your true potential to perform and achieve. I’ve arranged this book in four distinct parts that make up the full scope of what I call brain- training. After chapter 1, which sets the stage for your maximum- climbing journey, Part two begins with a study of brain physiology and the fascinating process of neuroplasticity (how your brain physically changes as a result of your thoughts, actions, and experiences) in chapter 2. Given this basic knowledge of brain function, chapter 3 delves into the specific processes by which the brain assimilates, learns, and directs skilled movements. 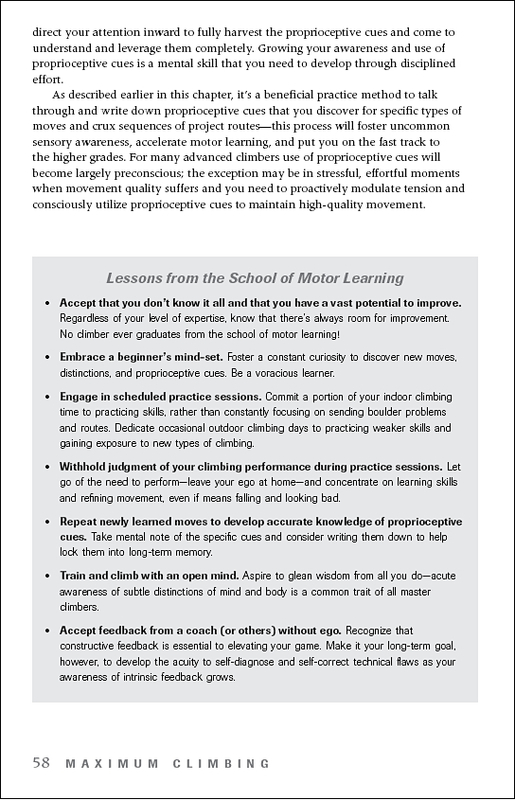 No matter how skilled or technically sound you are right now, I guarantee that you can improve your technique and efficiency of movement by applying the material in this chapter. 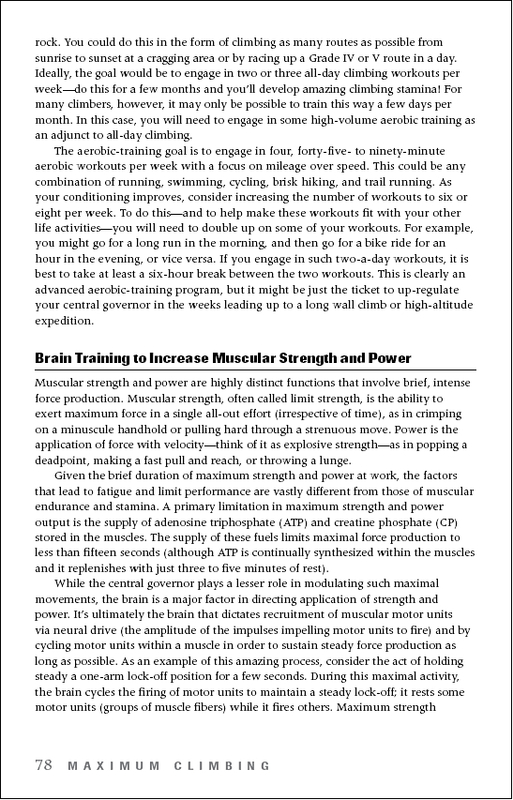 Chapter 4 goes on to explore how the brain governs the recruitment of the muscles and in doing so grossly restricts your maximum level of strength and stamina as a protective mechanism. The powerful implication of this overprotective “central governor” is that you can recalibrate (upward) the maximum threshold via specialized training techniques to enhance strength, power, muscular endurance, and stamina. Part three ventures into the cognitive realm of thoughts, fears, concentration, habits, strategy, and much more. 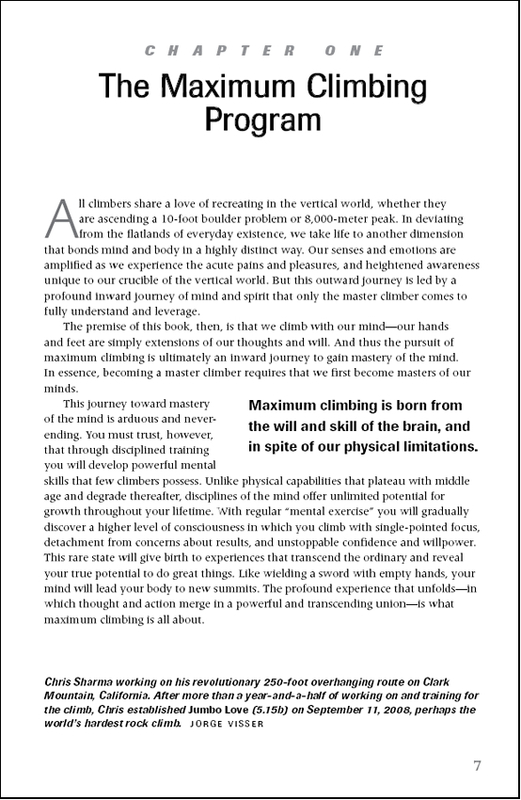 Master climbers think vastly differently from the mass of climbers. 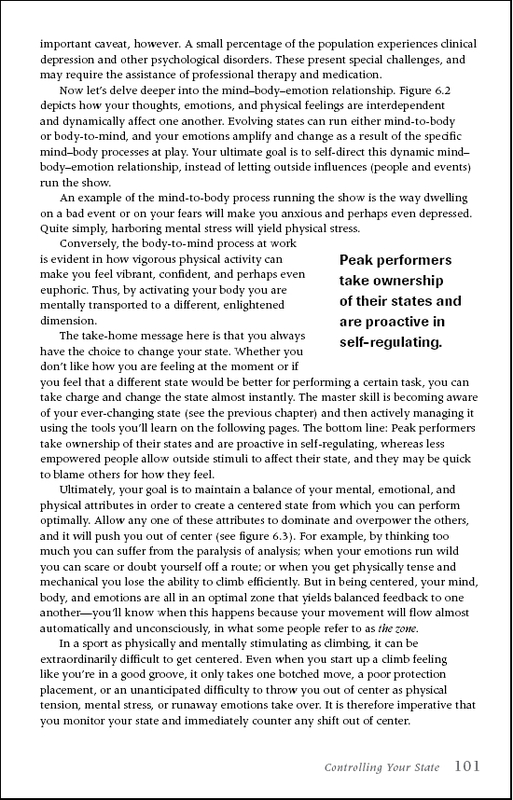 Elevating your performance and maximizing experience, thus demands that you elevate all aspects of your mental game. 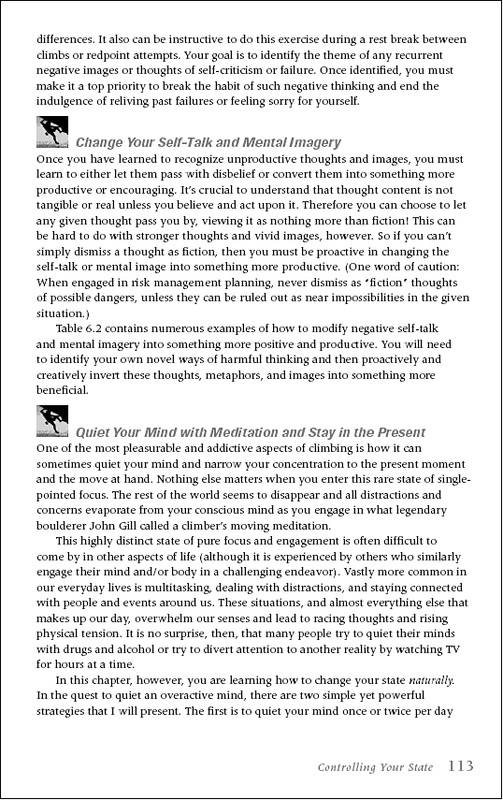 Chapter 5 begins the mental-training process with instruction on improving self-awareness. In climbing, the pinnacle of self-awareness is an acute on-demand monitoring of your internal climate and outward efficacy. Given this high level of self-awareness, you are empowered to make tiny course corrections on the fly that will maximize your chances of completing the climb. 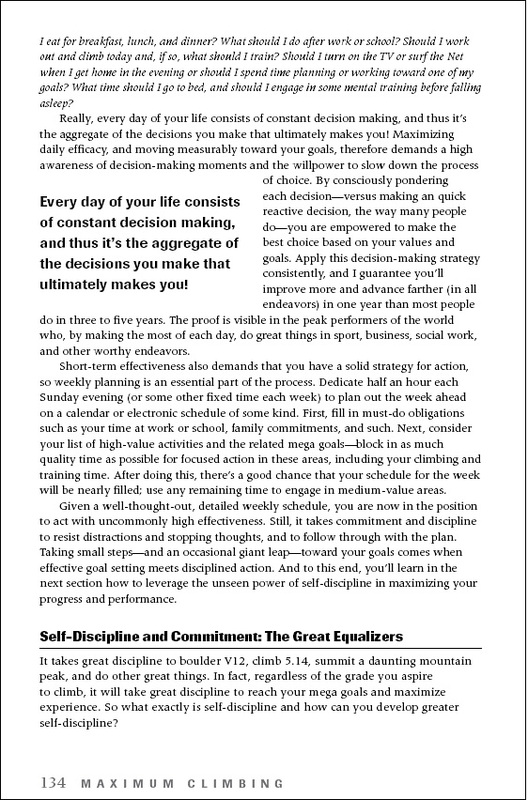 Toward this end, chapter 6 provides numerous self-regulation strategies for optimizing your mental, physical, and emotional states. 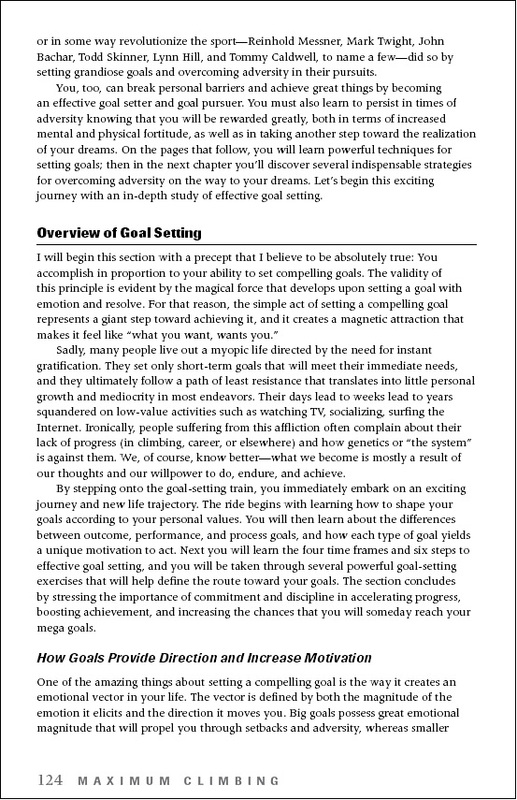 In chapter 7, the process of organizing and focusing your psychic energy moves on to goal- setting and goal- pursuit. Get ready to be engaged by a hands-on process of identifying your values, establishing some compelling goals, and analyzing what step you can take today to move closer to those goals. 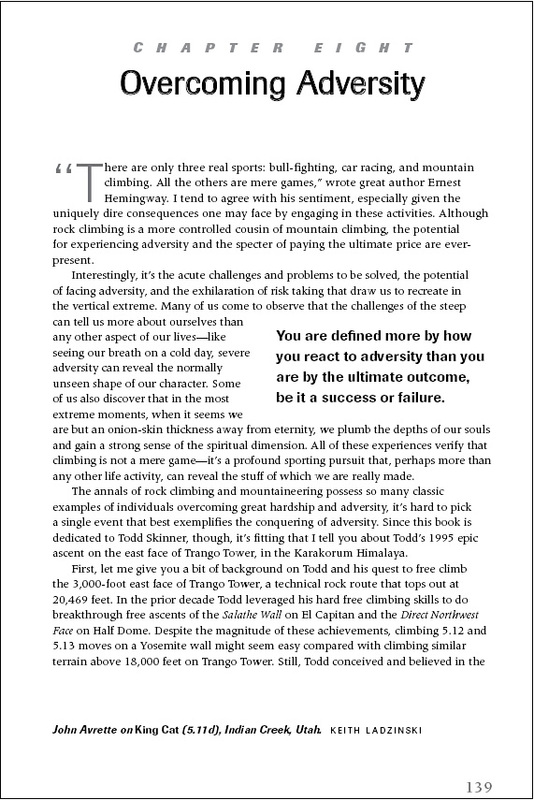 And since any worthy goal is likely to challenge you in unexpected ways, chapter 8 will arm you with ten indispensable strategies for overcoming adversity and problem solving. In exposing yourself to challenging situations, you must also come prepared with the mental skills needed to maintain concentration and manage fear in the face of technical difficulty, physical stress, and unexpected adversity. 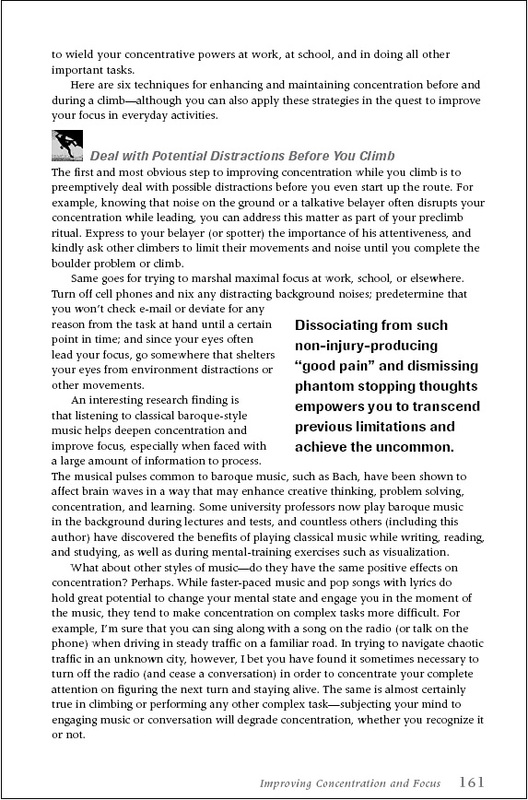 To aid your journey, chapter 9 serves up twelve powerful strategies for improving concentration and focus, while chapter 10 provides fourteen must-know techniques for managing fear. 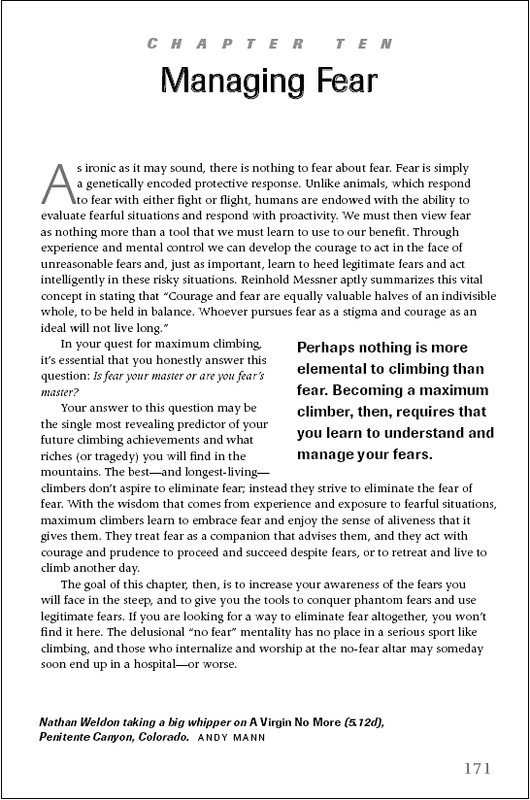 Perhaps nothing is more elemental to climbing than fear; and so learning to control fear (instead of letting it control you) is essential to performing your best. 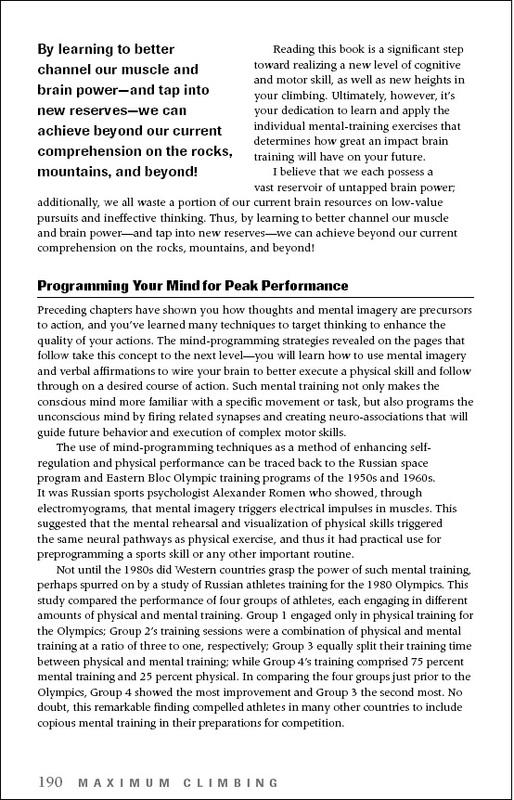 Part three then concludes with chapter 11’s broad study of mind-programming and behavior-modification techniques for improving conscious and unconscious brain function. 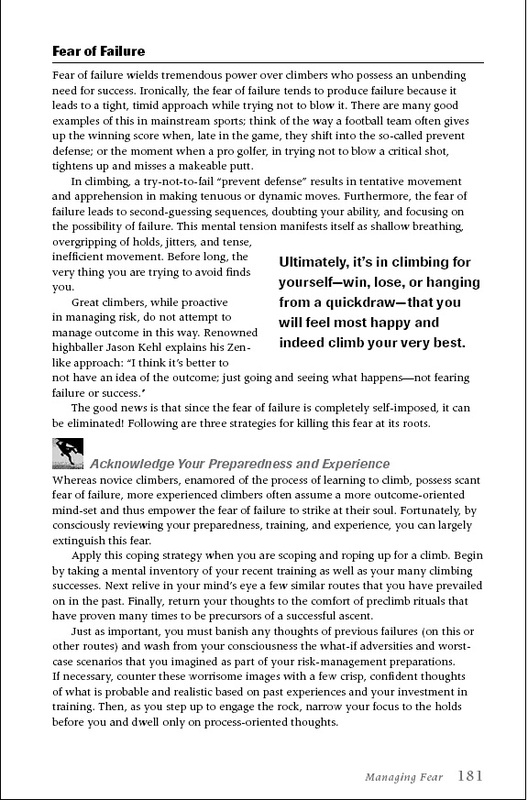 By learning and steadfastly applying these techniques, you will come to perform and achieve—in climbing and beyond—at a level that you can hardly imagine today! Part four of Maximum Climbing dovetails the many topics covered in parts two and three into a complete mental-training program. 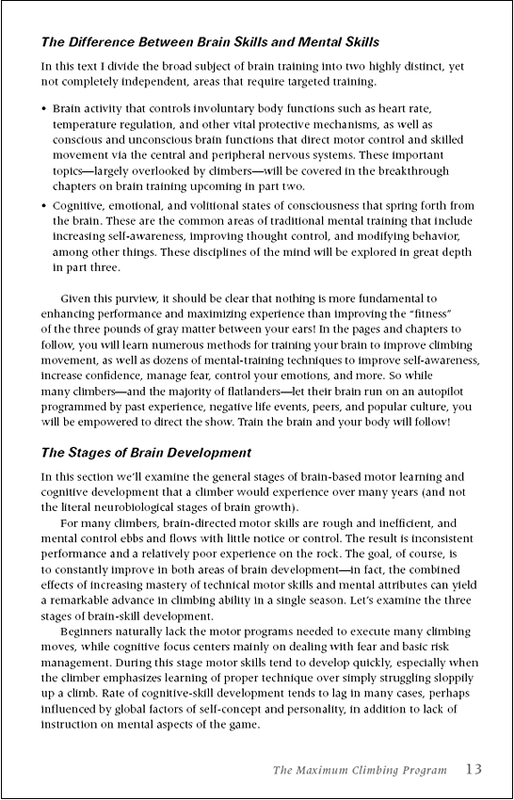 Chapter 12 details three stages of mental training that roughly correspond to beginner, intermediate, and elite levels of experience and commitment to climbing. 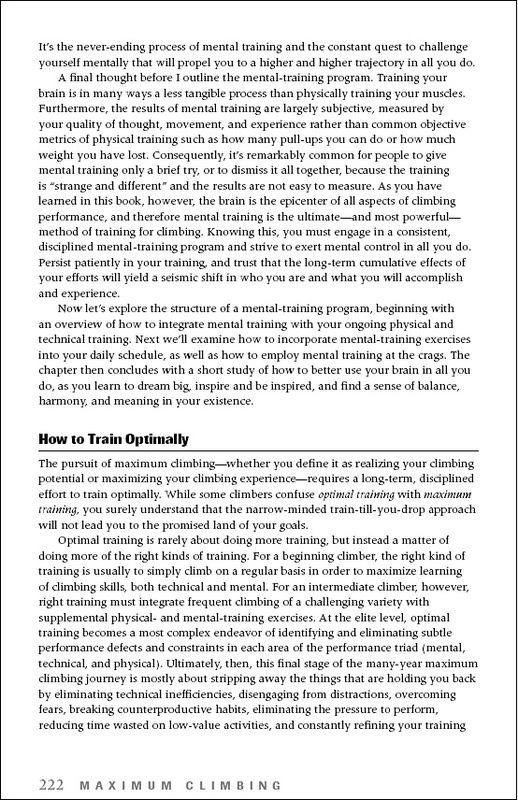 While you will certainly need to develop a personalized mental-training program to address specific goals and constraints, the three program stages that I outline will serve as a robust template to build upon. The book then comes to a close with what I hope will be inspiring sections on finding your own path in the sport of climbing, becoming a climber for life, and sharing your climbing power with the world. Into this book I’ve folded three decades of experience, study, and experimentation, as well as countless discussions with climbers (and minds) that are far greater than I. Maximum Climbing is thus a content-rich text with enormous information flow, and it has the astonishing potential to change and serve you in new ways as you change in the years to come. Therefore, I encourage you to frequently reference this text, and perhaps even re-read it annually, in search of new distinctions and strategies to help you prevail over evolving challenges and reach for higher goals. Ultimately, it’s your dedication to learn and apply the individual mental- training exercises that will determine how great an impact Maximum Climbing will have on your future. Knowing this, I hope you will begin a consistent, disciplined mental- training program and strive to exert greater mental control in all you do. Persist patiently in your training, and trust that the long-term cumulative effects of your efforts will yield a seismic shift in who you are and what you will accomplish and experience in the future. Dissolving the illusion of mind/body separation, Eric Hörst’s Maximum Climbing shows the way to achieve what I like to call one’s Vertical Path: a completely holistic state of being in which the spirit—the essence of climbing—is woven into the tapestries of our lives. 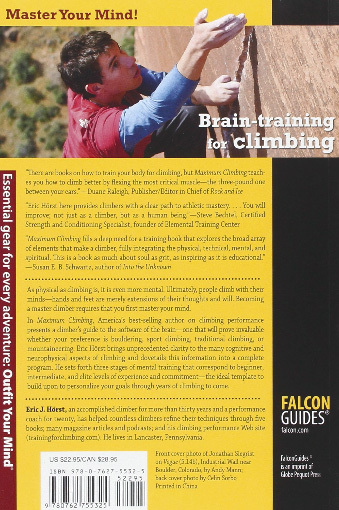 In this fascinating work, Eric Hörst reveals many of the secrets to rock climbing your best by tapping into the vast potential of the human brain. Soundly based in scientific research, Maximum Climbing is both user-friendly and interactive, drawing the reader into the book’s ideas and concepts through self-tests and exercises. I will strongly recommend this groundbreaking work to every one of my climbing students.